Since the 1970s historians interested in the impact of changing social and economic conditions on health outcomes have studied record collections that contain information about adult stature. Fluctuations in mean height by year of birth are potentially informative because they should reflect conditions encountered in utero and during the early years of life. Yet, like all historical records, surviving height series are not necessarily representative of the population as a whole. They are also subject to factors that might change over time. 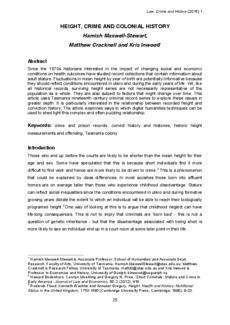 This article uses Tasmania nineteenth century criminal record series to explore these issues in greater depth. It is particularly interested in the relationship between recorded height and conviction history. The article examines ways in which digital humanities techniques can be used to shed light this complex and often puzzling relationship.